One of the first walks you’ll see coming into Point Pelee National Park is the Marsh Boardwalk (click here to view a comprehensive map of Point Pelee). The park info claims that the Marsh Boardwalk is a 45 minute walk, but when we walked it at a leisurely pace, it took us between 20-25 minutes. The entire walk is on a well-built boardwalk, totally elevated on solid water marsh. It wasn’t as filled with evident wildlife as the rest of the park, but was a favorite walk due to how peaceful it feels to be out on the water. After the walk, Miles gave me a begging look, basically asking me if he could chase the Canadian Geese nearby. Miles once got away at an agility park event (not during competition), and chased thousands of Canadian Geese. In circles, for 5 full minutes. It was terrifying. Thankfully they were as freaked out as I was. One goose could do some serious damage! How amazing about your family history. Most of my mother’s side of the family were from Ireland too. I wish I knew as much about that side of my family as you know of yours! 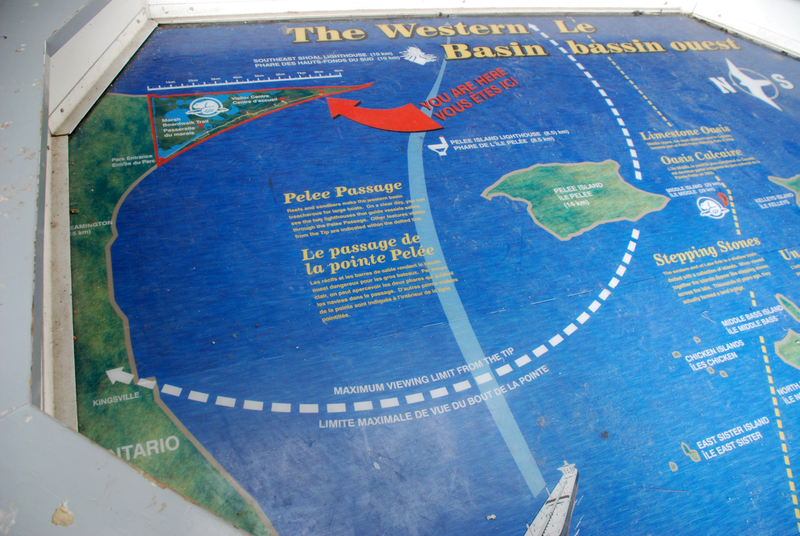 Of all of the islands in the area, how special that they lived on Pelee island. I have heard it is a really beautiful place. My mother has many memories from visiting as a child. It is almost like a neverland place in my memory, from all of the stories! I looked through my photos from the trip, and found this picture I took of a map they had displayed on the Point. I think you’ll find it very informative – click here to see it. Let me know what you think. And stay tuned, I have several more posts planned about Point Pelee National park. I walked all over, and learned a lot about the wildlife. I hope you can visit the area someday.